SAN DIEGO -- A video of San Diego County Animal Control taking a dog away from its owner is generating a lot of controversy on social media. The incident happened Saturday afternoon in Ocean Beach. A crowd of people gathered around the man, who is homeless, as officers were taking his dog. He can be heard screaming, "My dog didn't bite me. My dog didn't bite me." 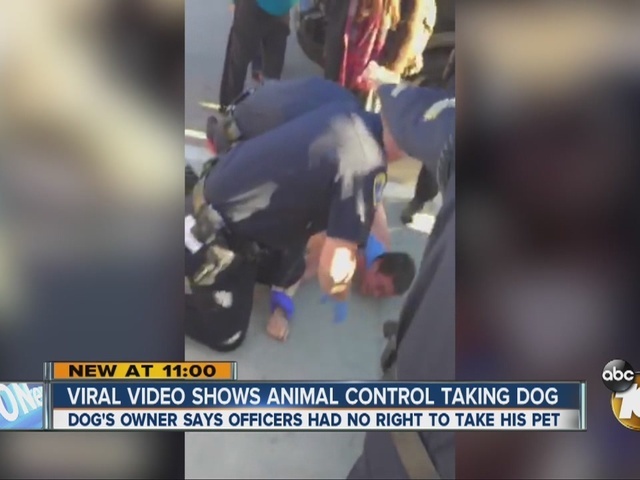 The video shows the man sitting on the ground hugging his dog while San Diego police and animal control officers try to remove the animal from his arms. Brad Crawford is one of many people who shot video. He said many of the witnesses insist the man's dog never bit him. "It was tough to watch definitely, me being a dog lover, I can only imagine having your dog taken from you, he didn't know what was going to happen," Crawford said. What the video doesn't show is what happened in the moments before the commotion. According to animal control officers, the homeless man was with his dog when another dog approached them. The two dogs got into a minor fight and the homeless man's own dog bit him. Witnesses say the homeless man's dog was on a leash; the dog that approached wasn't. Animal Control officers say most people don't realize that even if somebody is bitten by their own dog, the animal must be quarantined for 10 days to make sure it doesn't have rabies. Usually that happens at the person's home, but since the man is homeless, the dog was taken to the shelter. "Our officer went ahead and tried to explain the situation to the dog owner and it quickly escalated without the owner actually listening to what the officer was trying to explain, said Lt. Kalani Hudson with San Diego County Animal Services. The two-year-old bull terrier is at the Gaines Street Shelter. Hudson said the dog appears healthy and should be reunited with its owner when the quarantine is over. The owner, Anthony Andrew, was initially arrested for obstructing an officer, but charges were dropped and he was released Wednesday night. We caught up to him afterwards to get his side of the story. "She is a service dog and she helps out with veterans and their PTSD," Andrew said. "Even though my dog is the best dog ever, they're just doing that because I'm a homeless person. I don't have a home because I'm a traveler." Crawford thinks the officers should've taken more time to explain the situation to the dog's owner. 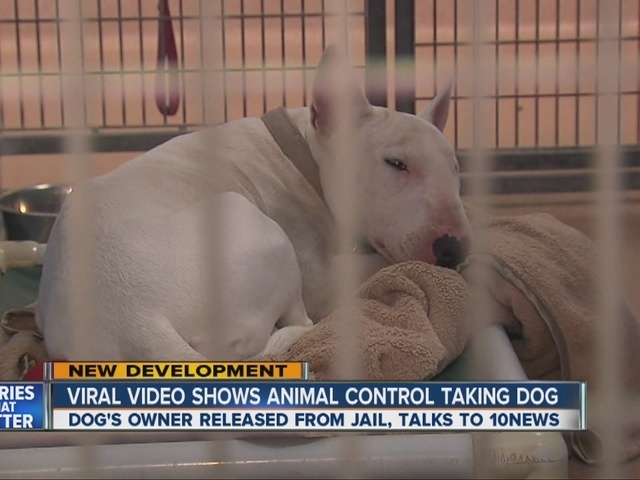 "They said he was going to quarantine, but for all he knows the dog could be put down and I think that's why he was reacting the way that he was," Crawford said. The dog is reportedly doing well and should be reunited with Andrew sometime next week. The video was posted on an Ocean Beach Facebook page and quickly generated more than 6,000 views.